I have drawn a series of gray squares on the left, with a red branch departing to the right. The goal is to have different red squares with a different saturation, but all with the same gray value. In the hsv color model, they all have the same v, but when I convert the image to grayscale using Gimp, they are not converted to the same gray. Also the visual impression is that the red squares on the right are darker than those on the left. 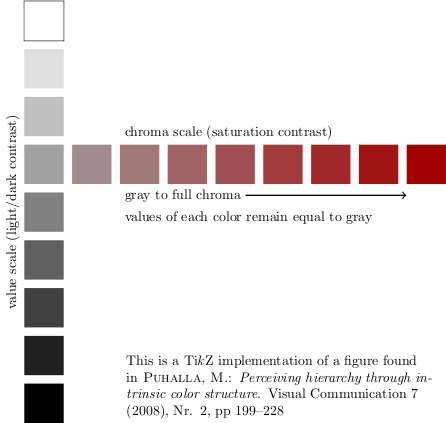 How can I, given a certain gray, calculate colors with a certain hue and the same gray value (or, even better, with the same gray impression)? The colors used in the image are all calculated, so I prefer solutions that incorporate calculations as well. I might have used wrong terms here - I'm a mechanical engineer, so please correct me where appropriate, or ask for clarification. 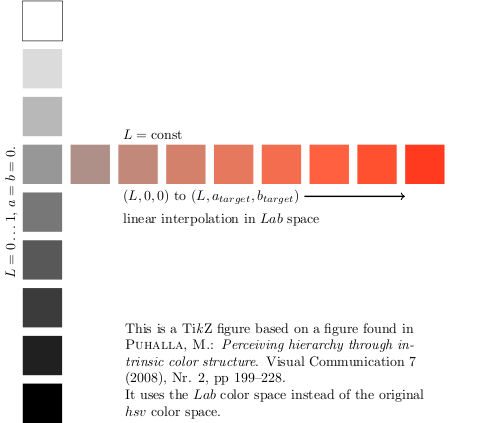 I can use the Lab model's L value to set some kind of gray value for different colors. In the hsv model this is v. I'm not sure if I am actually allowed to compare those, but I'll do it until someone complains. In the hsv model I can also set some "base color" (a hue), which I can't find in the Lab model. In the hsv model, I have 2 constants (in the image above: h = 0, v = 0.375) and one variable (s). Up to this point, I only have one constant in the Lab model. That is not enough to generate something similar to what I already made with the hsv model. I guess it's time for experiments. You could use Lab colour space to find your matches. Colours with the same L value as your target gray will look nearly identical when converted to grayscale. So, the above advice from Nick only works for 50% Luminance. If you apply any other L value same to different colors, the gray result is different. There must be a math for that, but you can do it on-screen by-eye. If you create all the colors you want and then lay a gray element (illustrator) or layer (photoshop) with its transparency mode to "color" (or saturation or hue), that'll make all the elements below to reveal its luminosity. You should make sure all the colors below that gray element have a saturation of 100, or you'll have gray-ish results, rather than nice colors. Now, the problem is: With all the methods above, you'll make all the elements the "same luminosity inside the used RGB profile", i.e. same gray for the selected "device", and the worst part: The eye is a device, and there are differences. You can show the same colors to different people and they will not find the same "evenness" as others. Add that to the fact that you are setting those colors as "same luminosity" in the selected device, and not only are they all "estimated", as soon as you show it in a different device, the effect will fail, because every device has its own ability to light the red green or blue elements with different intensities, so you could be getting, e.g. red-er elements. I'm a pre-press expert since '90s and my advice is: if you are going to go with the math, you should use the math for the eye (visual capabilities) as well as the ones for the device you will be showing those numbers on. Not the answer you're looking for? Browse other questions tagged color color-theory color-spaces or ask your own question. Formula for finding out the result of a color after applying x% opacity to it? If these colors all have the same lightness, then why does my brain tell me some are lighter than others? How to create a color of the same brightness and saturation? How can I create a color palette with the same saturation levels as a particular color?